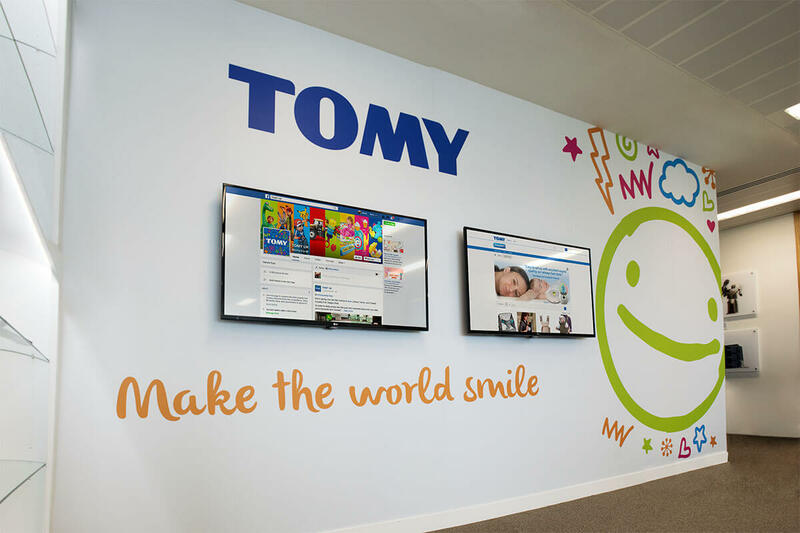 Tomy are a leading toy manufacturer with offices and distribution sites spread across Europe, Asia and America. In 2006 Tomy merged with a key competitor, Takara, with the aim of maximising their strengths to become the world’s top toy manufacturer. Until recently the Tomy European Headquarters were located in Sutton, United Kingdom. It was during this time that Cinos were approached and commissioned to upgrade the Tomy boardroom with control and presentation technologies. In 2015 Tomy relocated their European Headquarters to the Velocity building; a new state of the art office facility located in Brooklands. Situated on the top floor, Tomy now have an office with stunning contemporary architecture, high environmental standards and a large roof terrace overlooking the historic Brooklands racetrack. For Cinos, the office relocation project concerned two key areas; reinstalling the existing boardroom system in the Brooklands office as well as providing a presentation and conferencing solution for the new showroom. The latest toys and product ranges would be on display in the showroom. 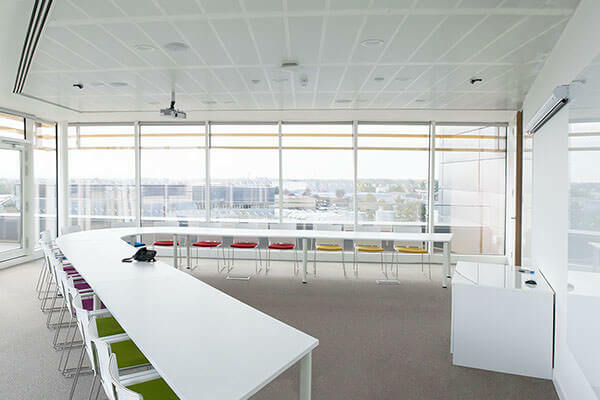 As such the room would be used for client meetings, company presentations and product demonstrations. A range of presentation, control and collaborative technologies were required to facilitate the activities of this area. Cinos have delivered an easy to use presentation and collaboration environment within the showroom at Tomy’s new European Headquarters. The technology solution in place has been designed with ‘ease of use’ in mind; enabling users to intuitively operate the system whilst focussing on the business at hand. Two ceiling mounted NEC projectors provide a crisp viewing experience for showroom users. The strategic positioning of the projectors and projection screens means that any user can see the content regardless of their position in the room. If required, separate sources can be displayed on each projector; allowing users to display presentations whilst viewing the incoming video conferencing feed. 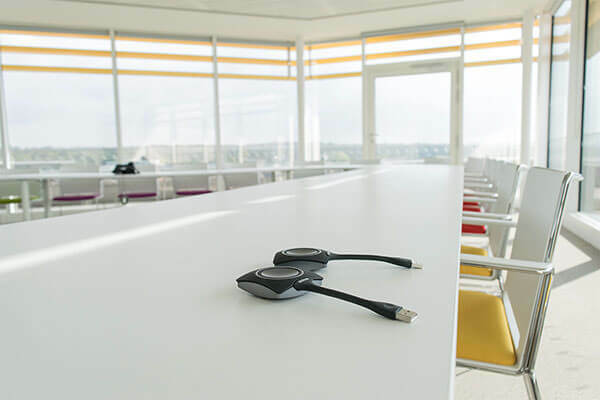 Users can share content at ease thanks to ClickShare from Barco. At the click of a button, via either a USB dongle or the ClickShare App, users can display content from their laptop, tablet or smartphone. Not only does this improve the meeting room experience, the elimination of multiple cables within the room provides a much more aesthetically pleasing presentation environment. When Tomy need to present or collaborate visually with clients and remote teams they can utilise the Zoom video conferencing client installed on the showroom PC. To deliver the best possible viewing experience Cinos installed two ceiling mounted Logitech C930e webcams. The 90-degree diagonal field of view ensures all participants can be seen clearly and provides the perfect solution for product demonstrations and presentations. Optimal audio coverage is achieved with strategically placed ceiling speakers working in conjunction with the Extron XPA 2001 amplifier. A range of audio visual technologies were deployed to handle the control and automation needs of the showroom. Users can operate the audio and video sources via the client-branded, wall-mounted AMX user interface. Behind the scenes, the Kramer HDMI matrix switcher and AMX NetLinx controller work together in allowing users to switch between various sources; whether that is sharing content via Barco ClickShare or displaying the incoming video conferencing feed. Whilst the main focus of this project was to deliver presentation and collaborative capabilities for the showroom, Cinos also had to transfer the existing boardroom technology from Sutton to the new Brooklands office. Used for internal meetings, the boardroom required a similar level of functionality to the showroom. As a smaller space only one projector was needed. The ability to share content from multiple sources was again achieved through the reinstallation of ClickShare, Logitech webcams and the AMX user interface. The existing automation technology was reutilised with the AMX NetLinx controller and Extron media presentation switcher responding to commands from the room touch panel. The final elements of the project involved installing three 49“ LG displays in the reception and communal meeting areas. Each of these displays were connected to a dedicated PC to showcase company news and corporate messages. Cinos have delivered excellent presentation and conferencing capabilities for the Tomy showroom and boardroom. Content can be viewed at ease courtesy of NEC projection. The strategic positioning of the projectors in the showroom allows all participants to see the content, regardless of their location in the room. Ceiling mounted Logitech webcams deliver an exceptional video conferencing experience. Logitech’s most advanced webcam yet boasts an extended view of 90 degrees; perfect for product demonstrations. 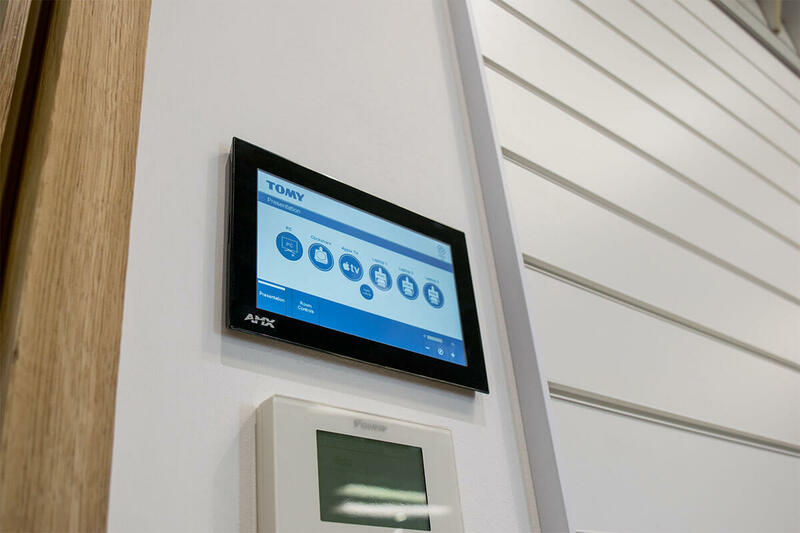 Each touch panel utilises the same client-branded interface to ensure the familiarity of the system is retained. The panel has been designed with the ease of use in mind; allowing any user to walk into the room and intuitively control the technology. Users can share and collaborate on content with ease with the implementation of Barco ClickShare. With one click users can share their presentation from their laptop, tablet or smartphone with no prior installation required. Rather than update the boardroom systems, Cinos proposed transferring the existing technology to the new Brooklands office. As the current solution was still fit for purpose, Cinos have avoided additional project costs for Tomy. Where possible Cinos have chosen future-proof technology with a low cost of ownership. 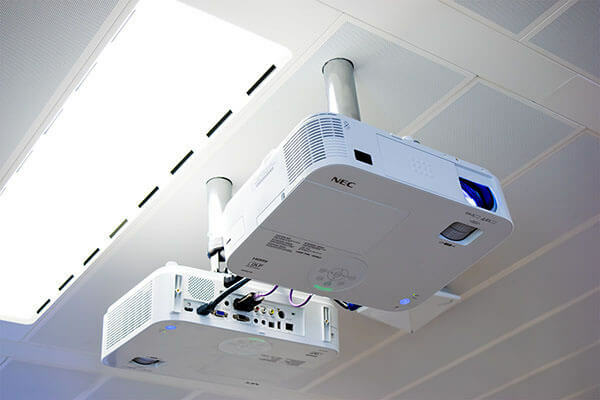 The NEC projectors offer a very long lamp and low power consumption. The introduction of Barco ClickShare caters for ‘non HDMI’ laptops; eliminating the need to incorporate legacy VGA technology. Wireless content sharing is achieved in both areas thanks Barco ClickShare. This easy to use solution requires no prior installation and allows users to start their presentation by simply pushing a button; whether from a USB-device connected to the presenters’ laptop, or by using the intuitive app for iPhone, iPad, or Android. ClickShare also automatically displays the most optimal resolution, without distorting the laptop display.